My favorite attraction at Disney's Hollywood Studios is, "The Indiana Jones Epic Stunt Spectacular". Jake and I always go several times when we visit WDW. In fact, the last time we went, I became so obsessed with the show that I looked up what stunt performers have to be able to do and started working out in order to match their strength. It EPIC failed, as I still can't even do one chin-up, but still...the show is amazing. 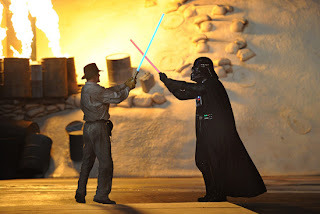 Well, this week, Disney shared this little photograph with people everywhere on their blog HERE. It's what happened when Darth Vader met Indiana Jones for a special edition of the stunt show. I bet it was a pretty amazing thing to see the stadium lit up like the Battle of Geonosis (*pushes glasses up nose*) with light sabers waving in pure geek pandemonium as Vader took on Jones. And here's the FINISHED PRODUCT! (Via an extremely well-shot video by the magazine that I write a monthly column for, Orlando Attractions.) It's downright amazing. Something EVERY geek will love. Amazing cameos too! (Notice the pan at the five minute mark, and half the extras, and, and...oh, just watch.) Get ready for some happy tears!